Synopsis: The finale of the Hawkeye Limited Series opens with Hawkeye and Mockingbird shackled to the wall in the coffin-filed basement of a mortuary. They soon meet their nemesis, who identifies himself as Crossfire and explains his origins as a CIA agent who went rogue and became a mercenary for hire. 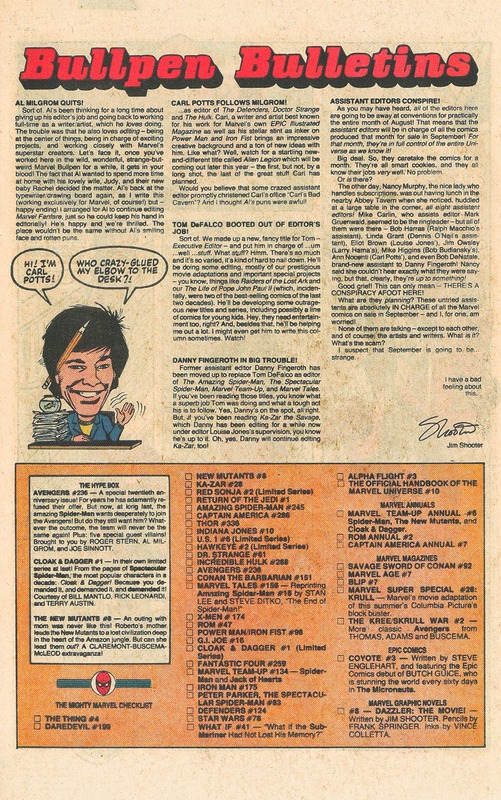 In order to prevent future opposition to his nefarious schemes, Crossfire initially hatched a plot to eliminate all superheroes, which was thwarted by Moon Knight and The Thing in MarvelTwo-In-One #52 (June 1979). Crossfire’s new plot involves a machine that can send sonic subliminal messages to directly stimulate the rage centers of living brains, which he plans to use on all of the heroes that attend Hawkeye’s funeral. He believes that he can make the heroes savagely attack each other, resulting in the slaughter of many of the weaker heroes and undermining the confidence of the survivors who will be wracked with guilt and likely subject to incarceration or government regulation. Crossfire tells Hawkeye that he was chosen because he was the weakest and most vulnerable costumed crime fighter in town and he intends to test out his rage machine on him and Mockingbird. After being deposited in a special room by Bombshell and Oddball, Hawkeye and Mockingbird are driven to mortal combat by Crossfire’s rage machine. They fight savagely in what is a remarkably evenly matched contest, although Mockingbird is clearly more skilled at hand-to-hand combat. During the melee, Crossfire turns off the machine in order to see how long it takes for the heroes to return to normal. This respite gives Hawkeye the opportunity to activate a sonic arrowhead that he had concealed in his tunic pouch. He places the arrowhead in his mouth, which blocks the effect of Crossfire’s rage machine and allows him to think clearly when the fight begins again. With a clear head, Hawkeye is able to beat Mockingbird, knocking her unconscious and then pretending to pass out himself. Believing that Mockingbird is dead and Hawkeye is unconscious from his injuries, Crossfire has Bombshell and Oddball retrieve their bodies. Hawkeye is able to incapacitate both of the minions and runs off to track down Crossfire. He finds the villain waiting for him, armed with his bow and arrow. To Crossfire’s surprise, he doesn’t have the strength to draw Hawkeye’s longbow and the concussion arrow falls the ground and explodes. “Weakest hero in town, am I, sucker? Then what does that make you? You didn’t have the strength to pull my 250 pound bow!” quips Hawkeye. With Crossfire out of action, Hawkeye runs back to find Mockingbird, breaking into tears when he thinks that he’s killed her. Fortunately she stirs and they embrace. The ending of the comic is really great because it’s a twist on the happy romantic ending that you would assume. 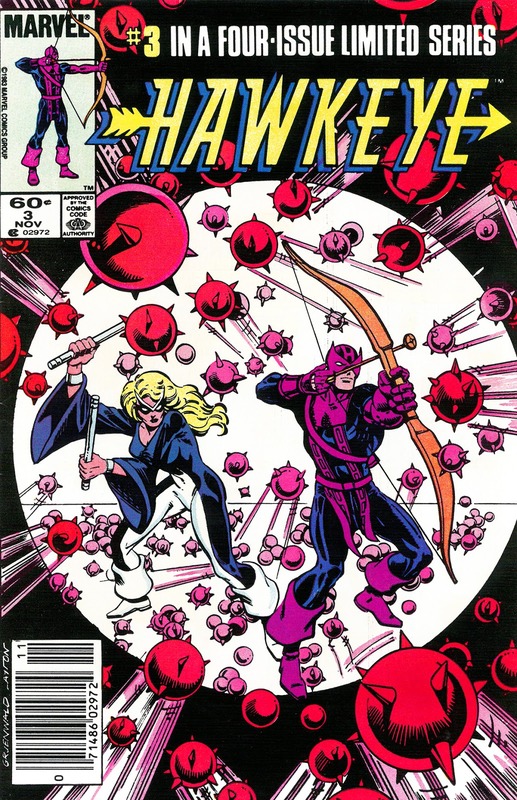 Mockingbird declares herself to Hawkeye, but the hero is deaf because of the effect of the sonic arrowhead and just nods his head, pretending to understand what she was saying and then walking away to her complete surprise. But… There is of course a happy ending as the last page of the issue finds our two heroes in a heart-shaped hot tub on their honeymoon at a resort in the Pocono Mountains in New York. The Hawkeye Limited Series was the hero’s first real solo adventure and a compelling look at a hero in the real world with a job and life outside of the Avengers. 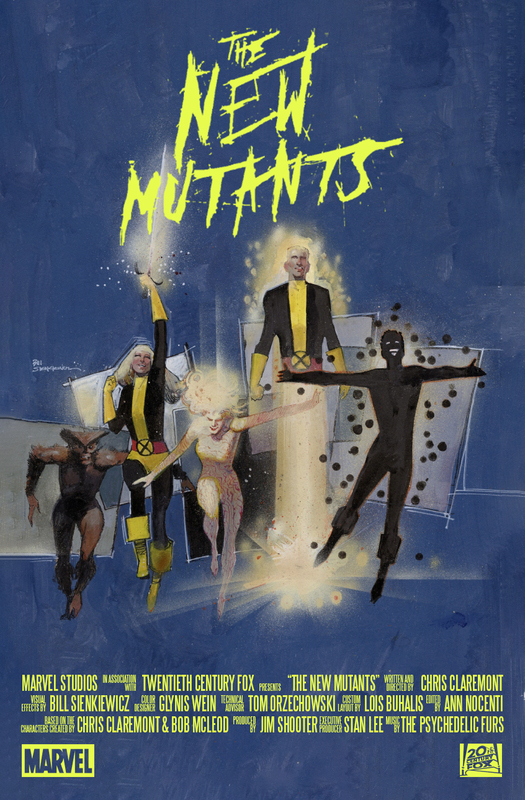 Having just read it all again, it’s a fun series that stands the test of time as a story that is as important and definitive in its own way for Clint Barton as Chris Claremont and Frank Miller’s Wolverine Limited Series for Logan. Hawkeye goes from being a solid second string character to a strong solo lead. He gets a new costume, saves the Marvel Universe from a nefarious plot, gets married and starts life down a new path that that ultimately leads to the formation of the West Coast Avengers and solidifies Hawkeye as one of the most beloved characters in the Marvel Universe. Those were sweeping developments for the House of Ideas that seemed to want to preserve their characters unchanged for all time. 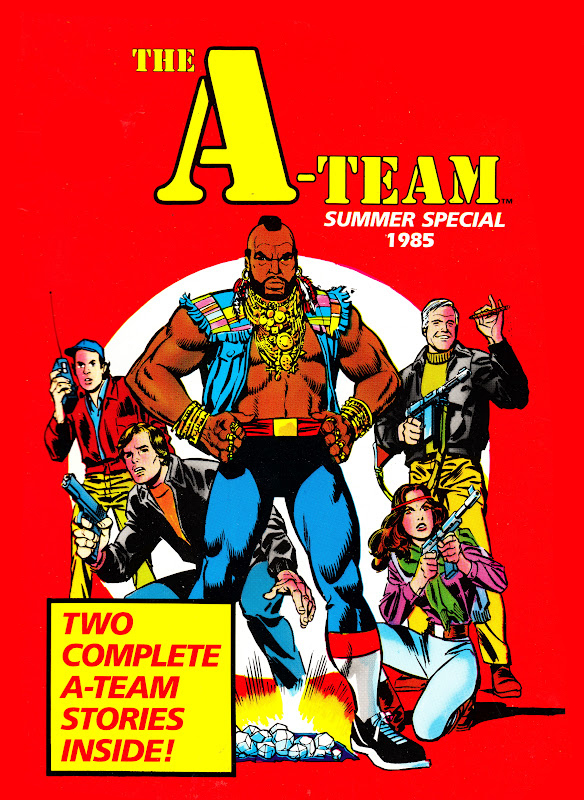 It was early days for Marvel’s Limited Series format that allowed it to really add depth to the characters in its universe and Kudos to Mark Gruenwald who really flexed his creative muscles with this story. His rare turn as an artist really pays off because it’s clear how important this story was for him. Synopsis: Hawkeye and Mockingbird return to Mockingbird’s apartment from their mission at CTE, watched carefully from a nearby rooftop by two new villains Bombshell and Oddball. The evil duo enjoys a brief moment of triumph when the apartment building blows up and they think that they’ve killed the heroes. But, they soon spot Hawkeye and Mockingbird on the street below and realize that the heroes must have discovered their trap. With both heroes now homeless, Mockingbird declares that “All we have left is each other” and throws herself at Hawkeye. Her sentiment is clearly not reciprocated and Hawkeye breaks the embrace after an awkward pause. The heroes find an 8-Ball in the wreckage of Mockingbird’s apartment, concluding that it may be a clue to the culprits of the bombing and setting off to find their assailants. 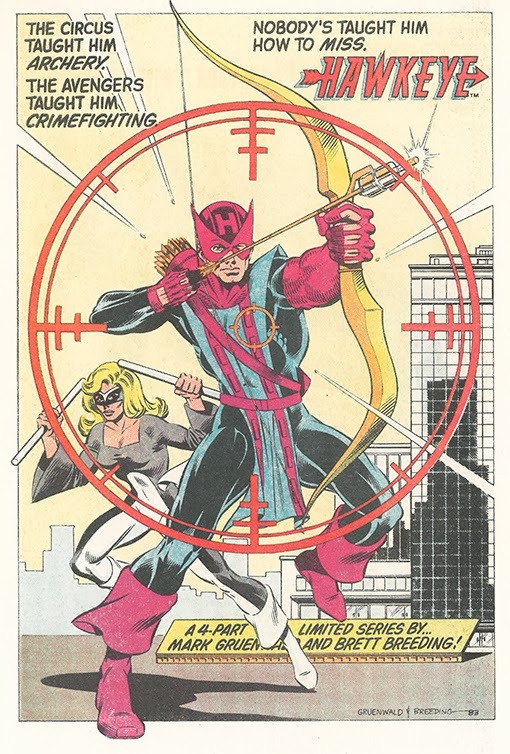 After withdrawing Mockingbird’s last $97 from the ATM, the hard-luck heroes buy a set of arrows for Hawkeye at a local sporting goods store and then jump on the subway so that they can stake out the location that they identified during their search of CTE in the previous issue. In true Marvel Universe style, the heroes bump into Steve Rogers on the subway, who offers to help his fellow Avenger. Hawkeye declines out of pride, leaving Mockingbird guessing about Steve’s alter ego. 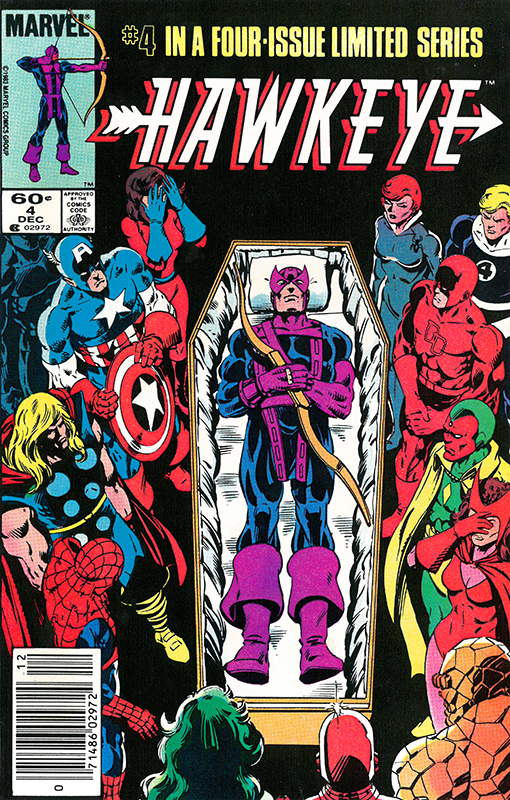 The issue ends with the villains carrying the unconscious heroes out of the subway to their boss who apparentlys wants to use Hawkeye and Mockingbird in some kind of experiment. To be concluded next issue in Last Rites! Synopsis: Hawkeye was dealt a series of devastating blows – emotional, financial and physical – in Hawkeye #1 and the second issue of the limited series opens with the Avenger at a personal low. Hawkeye returns to his apartment on his sky cycle, finding that it’s been completely emptied by the thugs at CTE. Mockingbird makes a surprise appearance and they return to her apartment where she offers to mend his costume and she shares her obligatory origin story for the benefit of the readers. Exhausted, Hawkeye falls asleep and Mockingbird takes off to run some errands. 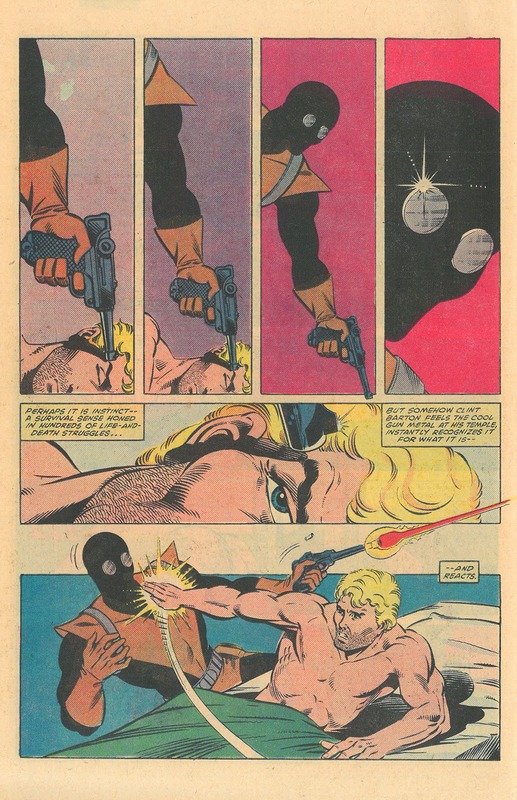 While Hawkeye rests, the masked assassin Silencer sneaks into Mockingbird’s apartment and puts a gun to the sleeping archer’s head. He wakes up in the nick of time and jumps to safety as Mockingbird returns and they drive the villain away. Hawkeye suits up in the new costume that Mockingbird made for him and the two heroes fly to Brooklyn on the archer’s sky cycle to visit his friend and former co-worker Jorge Latham, who offers them a clue about where they might find out what’s going at CTE. Hawkeye and Mockingbird return to CTE where they break into a locked file room to start digging for evidence of the plot. The Silencer surprises them in the act and Hawkeye takes the fight to him while Mockingbird continues searching the file room. Hawkeye knocks the Silencer through the window and the two land on the archer’s sky cycle where they spar back and forth until the villain gets the upper hand and knocks Hawkeye down a smokestack. 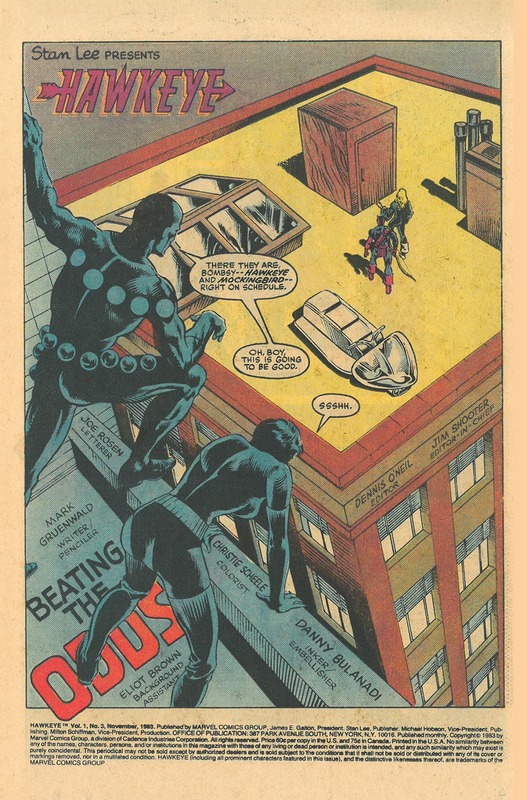 As the Silencer stands atop the smokestack, wondering how he’s going to get down, Hawkeye manages to climb back to the top and turn the tables on the assassin. With the villain out of the picture, Hawkeye summons his sky cycle and returns to pick up Mockingbird. Mockingbird was able to find detailed information on the mysterious party behind CTE’s nefarious plot that the two heroes will pursue next issue in Behind The 8-Ball! Marvel put on a full-court press to promote the Hawkeye Limited Series in 1983. 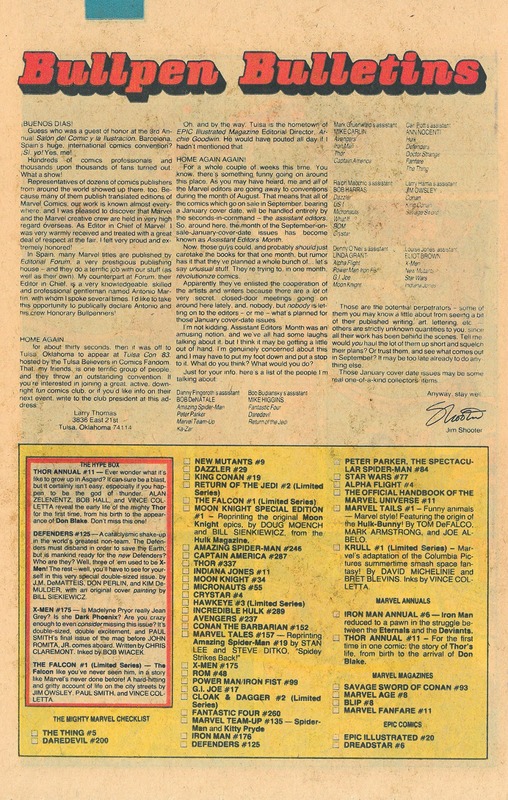 This house ad by Mark Gruenwald and Brett Breeding, which looks like it might have been a rough draft of the final cover to Hawkeye #1, appeared in Marvel's titles published in September and October 1983. 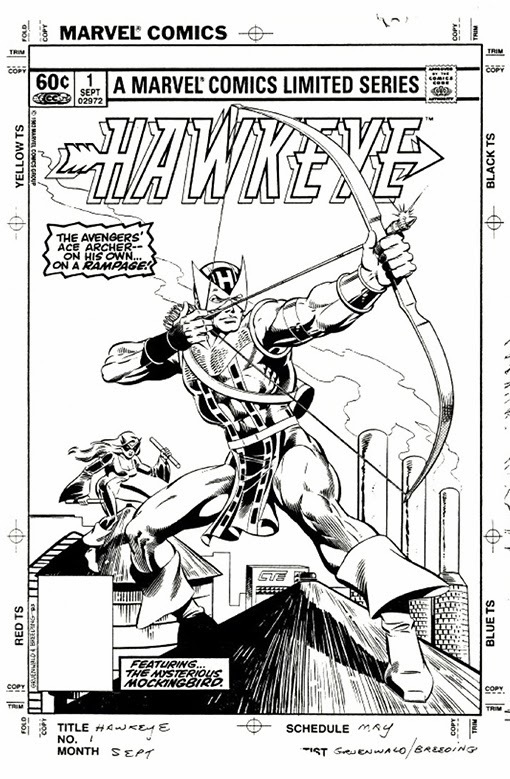 Hawkeye #1 features what is easily one of the most iconic and most memorable images of Marvel's beloved bowman ever to grace a cover. 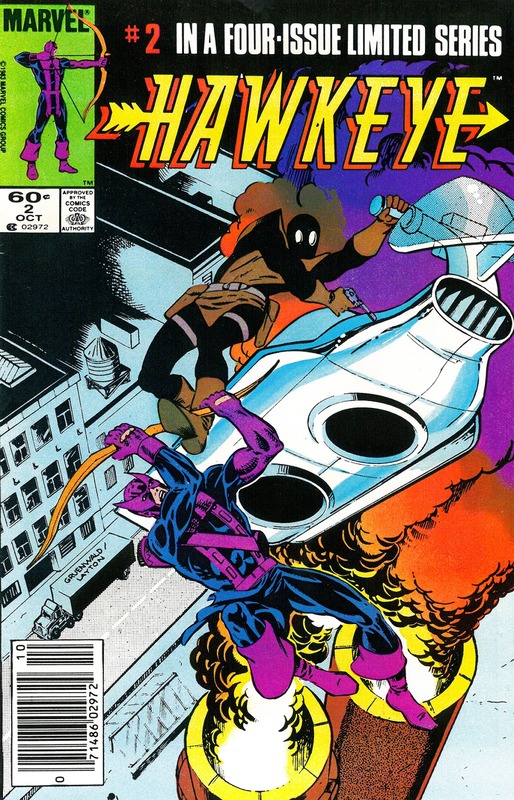 Artist Mark Gruenwald really nailed everything from Hawkeye's pose to the background and composition of the cover with Mockingbid approaching across the rooftops. 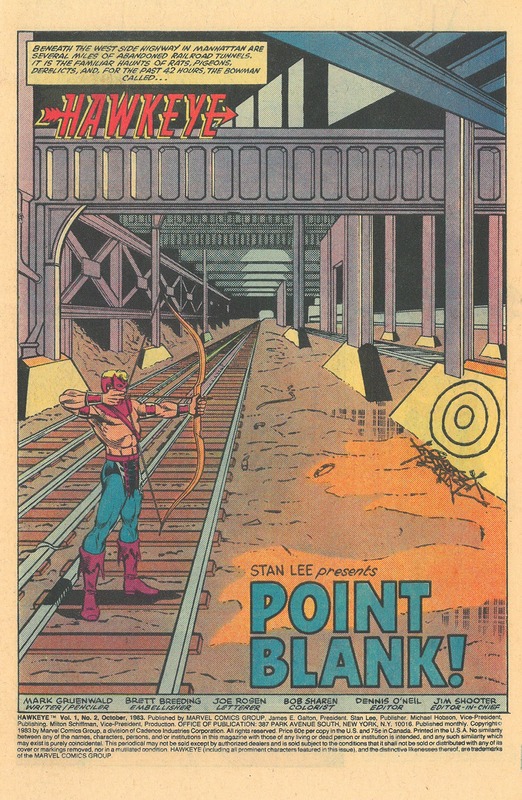 Gruenwald's fantastic art for the Hawkeye Limited Series is all the more remarkable because the creator is best known for his body of work as an editor and writer with this series representing one of his few turns as an artist at the House of Ideas.